Now I know that size doesn’t matter *coughs* but I’ve got a tiny confession to make- I’ve got a really small one!!! In fact I’ve never had such a small one in my life, but I had to make compromises when we moved so that we got some other great features like….like……ummmmm……why , WHY, did I do it??? Oh yes, for a house in Brighton, with a real garden, not a yard!! Soldiering on (I’m a glass half full kind of guy these days) I looked at what we had and decided to make the most of the space, whilst filling it with Flabulous things. But this wasn’t easy, we are talking a space of about 6ft by 5ft with THREE doors going into it!! Lets just say we are short on pretty much everything except doors!! So it was back to the word ‘compromise’. 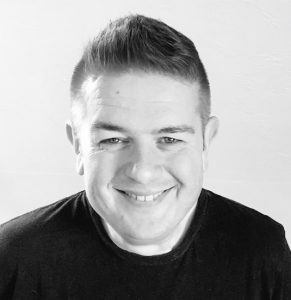 There were some things that HAD to stay….a dishwasher- no matter how ‘compact’ -a proper coffee machine, a cooker as close to a range as I could get, a breadbin and proper kitchen scales were all essentials I needed to cram in somewhere. Things I could live without now reside in our loft and everything else has been streamlined. I have had to make some big sacrifices!! first to go was my Nigella (some of you would call this a larder, I have affectionately called it my nigella for years) as this now has the fridge freezer in it!! 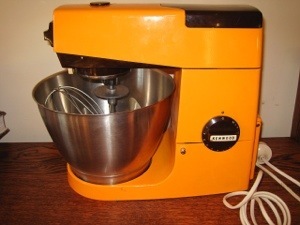 But it does also house all my baking paraphernalia and my fab vintage mustard coloured kenwood chef, Doris!! I’ve also made some fantastic purchases which have saved soooo much space. Top of this list has to be my stacking saucepan set, which hides in a cupboard next to the oven and includes pasta strainer, 2 steamers and a Bain Marie atop a fab pan big enough to do a families roast potatoes or make soup. She ain’t pretty but boy is she versatile!! 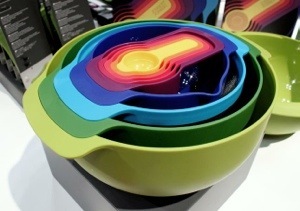 My biggest saviour has to be Joseph Joseph who make the coolest space Saving kitchen kit!! I now have an amazing set of chopping boards, colour coded and which take up less space than my old chopping board!! I also have their nesting baking bowl set which includes everything from a massive mixing bowl to a set of cup measures and a seive….I could not bake without this set, yet it takes up the room of one bowl…love it!! Finding a coffee machine that made decent espresso and also steamed milk well enough was a challenge. 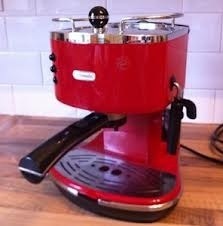 I haven’t got the room or wallet for a semi commercial machine but I LOVE coffee so , after lots of testing, we settled on Delonghi’s Icona espresso machine, which was also available in RED!!!!! Not only does this baby make pretty decent espresso but it also whacks out amazing lattes and fits into the corner of our tiny kitchen, which I may have mentioned has very little space. Once I’d got the essentials in I started to look at the best way to use the space! I’m lucky and inherited my nan’s bureau, which is like a tardis that sits in the corner of my lounge. its filled not only with my posh glasses, but also a drinks cabinet and all of my poole pottery dinner service, so when we have guests we serve drinks from there…kitchen, what kitchen? I have a Jamie Oliver dinner service in light blue that we got for a ‘wedding’ present which stays in one of the kitchen cupboards and we use daily. I’ve limited the Tupperware we use to about 4 pieces (if the Dazzler has a fetish, it’s Tupperware, we have bag loads of it in the loft!!) 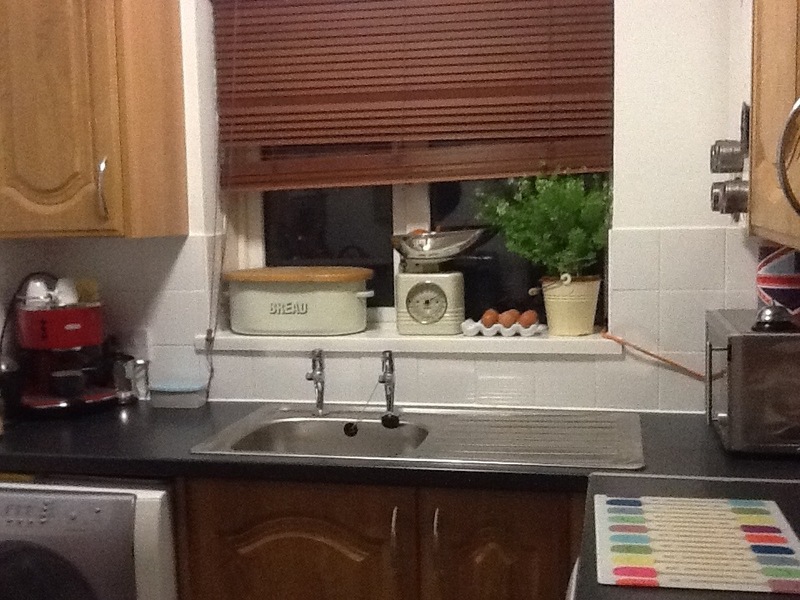 and have all my pulses, preserves, pasta and rice in nice jars on the cupboard tops. The cupboard under the sink is my other tardis and, thanks to careful management, fits in all our cleaning stuff and miscellaneous detritus. This leaves one cupboard for food and the walls filled with a variety of Le Creuset pots and trendy items, including joseph joseph utensils, that all look flabulous and I don’t mind people seeing!! 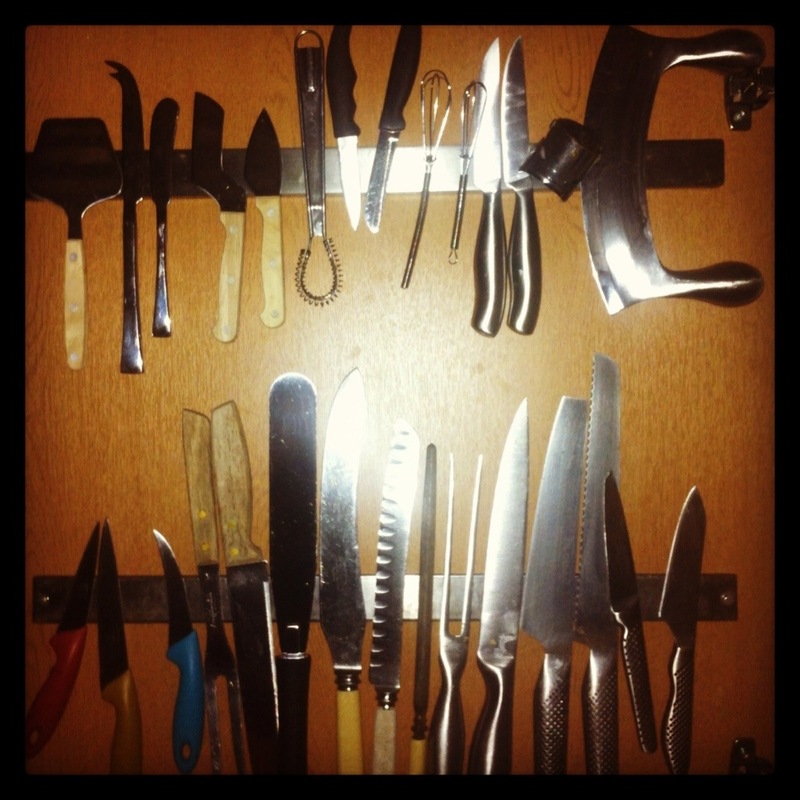 One of my top tips if you are space challenged is to invest in magnetic knife racks. Then fix them inside a large cupboard door. (a high up one if you’ve got kids) It holds so much and we arent just talking knives here, pretty much anything that can work with magnets!! whilst using otherwise dead space…. So that’s pretty much it, I did manage to get a lickle ‘range like’ cooker with a dual oven/grill and I’ve even managed to squeeze in a wine rack, but let’s talk about toast. 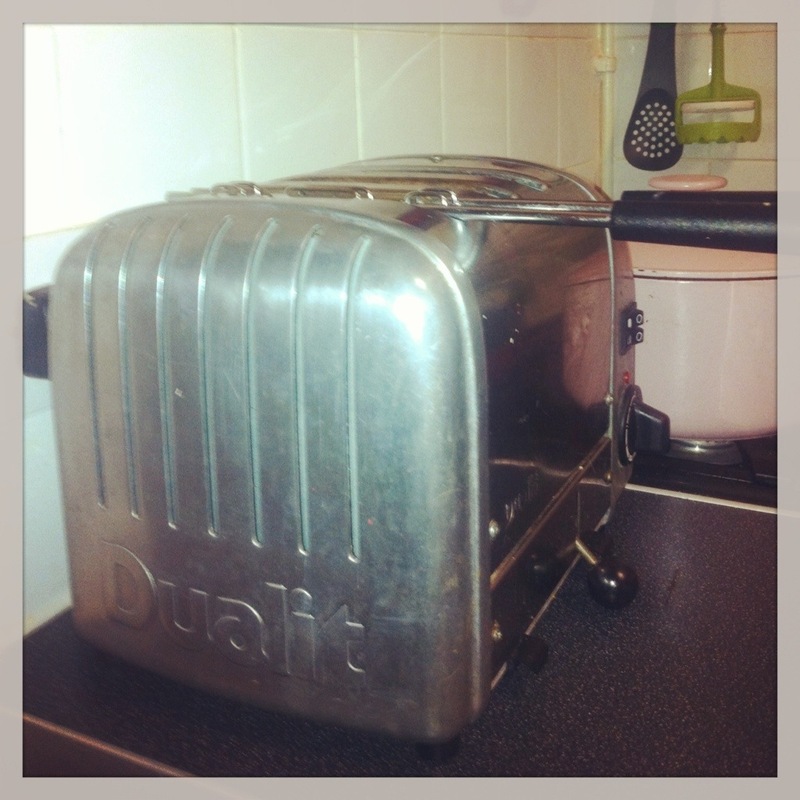 I’ve had my toaster for over 15 years and she is showing no signs of dying! When I got her she was already 5 years old so she’s in her twenties and makes the best toast EVER!! Why am I telling you this? Because she cost a small fortune and takes up a fair bit of room, but we have history and I couldn’t let her go!! Next Post We’ve got a way to go! !